How do I report a streetlight that is out, or check on the status of a reported outage? Please visit the Consumers Energy Streetlight Outage page. Who do I call to report problems with my water, a running fire hydrant, or a broken water main? Please call the City of Flint, Water Service Department at (810) 766-7202. I have overgrown brush/trees that I can’t remove myself, what should I do? I have an outdoor light that is out and I can’t change it myself, what can I do? When can I put large items or brush out with my trash? What can I recycle and when is curbside recycling? 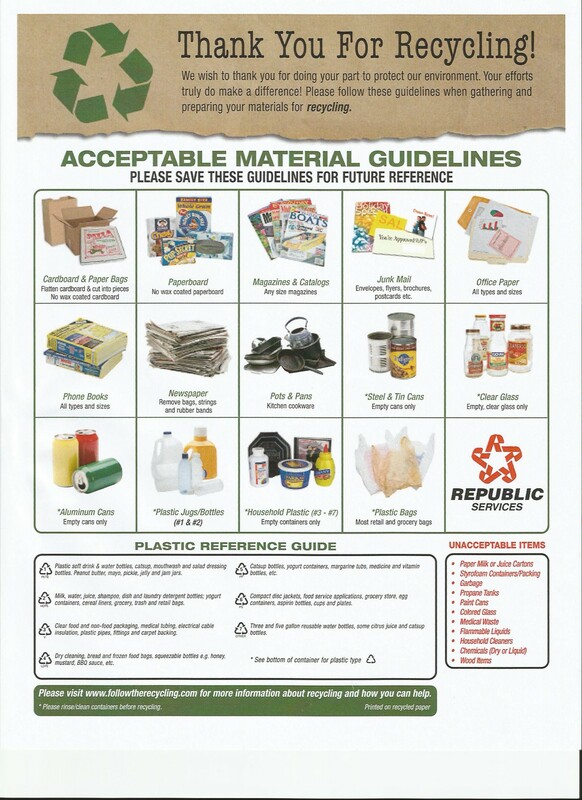 Republic Services will pick up these items for recycling. Republic picks up recycling every. If you have any questions please contact Republic at (888) 872-7455. I need help with snow or leaf removal, who do I contact? Please contact Mott Park via email or phone (810) 771-5714. When and where are the neighborhood meetings and other events? Please check our calendar for upcoming events. Who do I contact for a ride to the neighborhood meetings? I believe the party/liquor store is violating sign ordinances and/or selling to minors, what do I do? Please fill out this form and email it to Officer Tanya Meeks or fax it to (810) 237-6969. I have disabilities or am a senior citizen and would like to help, what can I do? You can do a great deal! Please print this observation log or fill in the online form to be eyes, ears and mouth. Your help is greatly needed! © 2019 Mott Park Neighborhood Association, all rights reserved. | Proudly designed and maintained by Zoda Design, LLC.